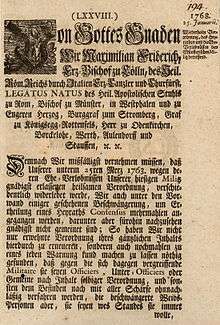 The Antiqua–Fraktur dispute was a typographical dispute in 19th- and early 20th-century Germany. In most European countries, blackletter typefaces like the German Fraktur were displaced with the creation of the Antiqua typefaces in the 15th and 16th centuries. However, in Germany, both typefaces coexisted until the first half of the 20th century. During that time, both typefaces gained ideological connotations in Germany, which led to long and heated disputes on what was the "correct" typeface to use. The eventual outcome was that the Antiqua-type fonts won, when the Nazi party chose to phase out the more ornate-looking Fraktur. Historically, the dispute originates in the differing use of these two typefaces in most intellectual texts – for Latin texts, Antiqua-type typefaces were normally used, whereas Fraktur was favoured for works written in German. This extended even to English–German dictionaries, for example, where the English words were all written in Antiqua and the German words in Fraktur. Originally this was simply a convention. Conflict over the two typefaces first came to a head after the occupation of Germany and dissolution of the Holy Roman Empire by Napoleon in 1806, which led to a period in the history of Germany in which nationalists began to attempt to define what cultural values were common to all Germans. There was a massive effort to canonize the German national literature—for example the Grimm Brothers' collection of fairy tales—and to create a unified German grammar. In the context of these debates, the two typefaces became increasingly polarized: Antiqua typefaces were seen to be "un-German", and they were seen to represent this by virtue of their connotations as "shallow", "light", and "not serious". In contrast, Fraktur, with its much darker and denser script, was viewed as representing the alleged German virtues such as depth and sobriety. During the Romantic Era, in which the Middle Ages were glorified, the Fraktur typefaces additionally gained the (historically incorrect) interpretation that they represented the German Gothicism. For instance, Goethe's mother advised her son, who had taken to the clear Antiqua typefaces, to remain—"for God's sake"—German, even in his letters. Otto von Bismarck was a keen supporter of German typefaces. He refused gifts of German books in Antiqua typefaces and returned them to sender with the statement Deutsche Bücher in lateinischen Buchstaben lese ich nicht! (I do not read German books in Latin letters!). The dispute between Antiqua and Fraktur continued into the 20th century. The arguments in favour of Fraktur were based not only on historical and cultural perceptions but also on the claim that Fraktur was more suited for printing German and other Germanic languages, being more readable than Antiqua for this purpose. German script is a real reading script: it is more readable, i.e. the word images are clearer, than Latin script. German script is more compact in printing, which is an advantage for fast recognition of word images while reading. German script is more suitable for expressing German language, as it is more adapted to the characteristics of the German language than the Latin script. German script is still prone to development; Latin script is set in stone. German script makes it easier for foreigners to understand the German language. Latin script will gradually lose its position as international script through the progress of the Anglo-Saxon world (here the author states that Anglo-Saxons in the UK, the United States and Australia are still "Germanic" enough to annihilate the Latin-scriptler's dream of a Latin "world-script"). The use of Latin script for German language will promote its infestation with foreign words. German script does not impede at all the proliferation of German language and German culture in other countries. On May 4, 1911, a peak in the dispute was reached during a vote in the Reichstag. The Verein für Altschrift ("society for old-script", which, however, supported the Antiqua) had submitted a proposition to make Antiqua the official typeface (Fraktur had been the official typeface since the foundation of the German Empire) and no longer teach German Kurrent (blackletter cursive) in the schools. After a long and, in places, very emotional debate, the proposition was narrowly rejected 85–82. The Fraktur typefaces were particularly heavily used during the time of Nazism, when they were initially represented as true German script, the press scolded for its frequent use of "Roman characters" under "Jewish influence" and German émigrés urged to use only "German script". However, in 1941 Fraktur was banned in a Schrifterlass (edict on script) signed by Martin Bormann as so-called Schwabacher Judenlettern ("Schwabacher Jewish letters"). The edict mentions publications destined for foreign countries, so one possible reason for the reversal of policy was that Antiqua would be more legible to those living in the occupied areas; the impetus for a rapid change in policy probably came from Joseph Goebbels and his Propaganda Ministry. Indeed, readers outside German-speaking countries were by then largely unfamiliar with Fraktur typefaces. However, the Nazis had been printing books, newspapers and miscellaneous texts destined for abroad in Antiqua for a long time. Therefore, they would have been able to print everything for the occupied areas in Antiqua without the need to change the use of typefaces in the German-speaking areas. Bormann's edict of 3 January 1941 at first forbade only the use of blackletter typefaces. A second memorandum banned the use of Kurrent, including Sütterlin, which had only been introduced in the 1920s. From the academic year 1941–42 onwards, only the so-called Normalschrift ("normal script"), which had hitherto been taught alongside Sütterlin under the name of "Latin script", was allowed to be used and taught. However, Kurrent remained in use until 1945 on SS insignia (names of SS-Divisions, etc.) and in some other cases. After the Second World War the Sütterlin script was once again taught in the schools of some German states as an additional script, but it could not hold for long against the Latin cursive scripts. Since few people remain who can read Kurrent, most old letters, diaries, etc. remain inaccessible for all but the oldest German speakers. As a consequence, most German-speaking people today find it difficult to decipher their own parents' or grandparents' letters, diaries, or certificates. The Fraktur script remains present in everyday life in some pub signs, beer brands and other forms of advertisement, where it is used to convey a certain rusticity and oldness. However, the letterforms used in many of these more recent applications deviate from the traditional letterforms, specifically in the frequent untraditional use of the round s instead of the long s (ſ) at the beginning of a syllable, the omission of ligatures, and the use of letter-forms more similar to Antiqua for certain especially hard-to-read Fraktur letters such as k. Books wholly written in Fraktur are nowadays read mostly for particular interests. Since many people have difficulty reading blackletter, they may have difficulty accessing older editions of literary works in German. A few organizations such as the Bund für deutsche Schrift und Sprache continue to advocate the use of Fraktur typefaces, highlighting their cultural and historical heritage and their advantages when used for printing Germanic languages. But these organizations are small, somewhat sectarian, and not particularly well known in Germany. In the United States, Mexico, and Central America, Old Order Amish, Old Order Mennonite, and Old Colony Mennonite schools still teach the Kurrent handwriting and Fraktur script. German books printed by Amish and Mennonite printers use the Fraktur script. ↑ Adolf Reinecke, Die deutsche Buchstabenschrift: ihre Entstehung und Entwicklung, ihre Zweckmäßigkeit und völkische Bedeutung, Leipzig, Hasert, 1910, p. 79. ↑ Reinecke, pp. 42, 44. ↑ Reinecke, pp. 42, 49. ↑ Eric Michaud, The Cult of Art in Nazi Germany, tr. Janet Lloyd, Stanford, California: Stanford University Press, 2004, ISBN 9780804743266, pp. 215–16 and Plate 110. ↑ from Völkischer Beobachter Issue 250, Sept. 7, 1934. This article incorporates text translated from the corresponding German Wikipedia article as of December 2005.